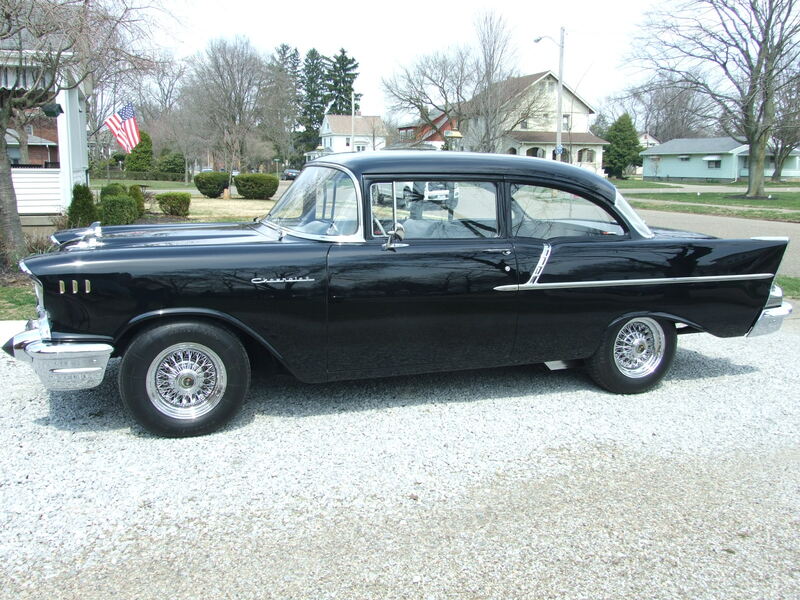 “Black Widow” Potential, Rare Model, Same Family Owned 30 + Yrs., 2 Sets of Wheels & Tires, Old School w/ more Power, Original 6 Cylinder Engine Included. 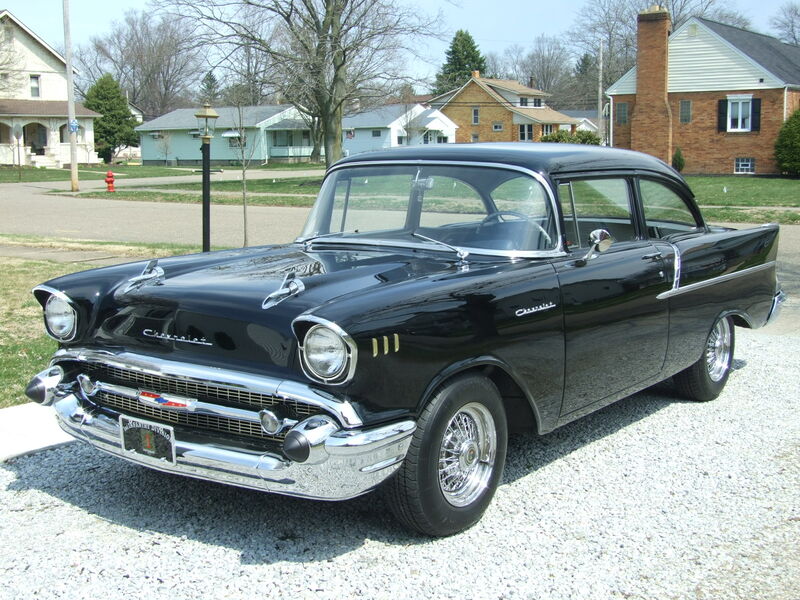 Husband had a 57 in high school, and always wanted another. Family purchased car in approx. 1983-1984, car repainted early 90’s approx. buy a local painter/friend. 6 Cylinder and 3 speed pulled and upgraded to 350 C.I. with 4 speed. * We do not see any imperfection, or any orange peel in its completion. * I did not notice any scratches in the paint. Being extremely critical the hood has a few small water spots that you can faintly see under florescent lights, that could most likely be polished out. * Although I cant say the body is laser straight or perfect, it is extremely close to that. * The body was professionally, and expertly prepared prior to receiving paint. In terms of preparing it to be straight as possible, it was beautifully done. It closely represents how the car was new or possibly better. Pay attention to pictures of each individual panel at a slight angle, and you will see how impressive it is. * In taking several random readings on each panel of the car, will report that for the most part the paint appears to be in the area of 6-12 mils of thickness. This is very much appropriate in lacquer work, and will probably help in lessening the amount of future cracking vs a much thicker paint. * The paint is a little thicker on the doors themselves which could certainly be the result of additional work to get them straight. * In the lower portion of the quarters we are not getting higher readings that would indicate significant obvious rust perforation repair. * It seems like the bottom of the front fenders, and maybe a slight amount in the corners of the doors could have had some repairs at some point. Over all its where you would expect to see it. * In inspecting the stainless that surrounds the rear window and windshield, including the spheres that run down the quarters, windshield wiper arms, and V shaped stainless that is above the taillight bezels, it is all in very nice straight condition. They show very minimal wear, and I did not notice any damage or dents to those items. They all appear to be firmly secure to the car. * In looking at all the glass in general it is very nice and clear. * The glass is amazingly nice, and it shows that someone was careful not to get the typical grind marks or scratches. * All of the glass excluding the passengers window and vent have an older looking LOF Safety Plate on them that certainly could indicate it being older glass, but in very nice condition. * The windshield does have multiple pin head size nicks that you get from normal driving, that would probably show up more at night. Also a small partiall bulls eye at the lower portion of the driver view. * There are maybe a couple of two inch long light scratches in the middle lower third of the rear window, but not seeing any on the side windows. * Owners didn’t drive with the wiper arms on but they are included. * They believe the utility area and trunk mats to be original, or at least of a much older manufacture. * Owner had new headliner and visors installed, and front seat repadded. The visors are nice and solid, and headliner is neatly done without flaws, and all the stitching is holding nice and tight. 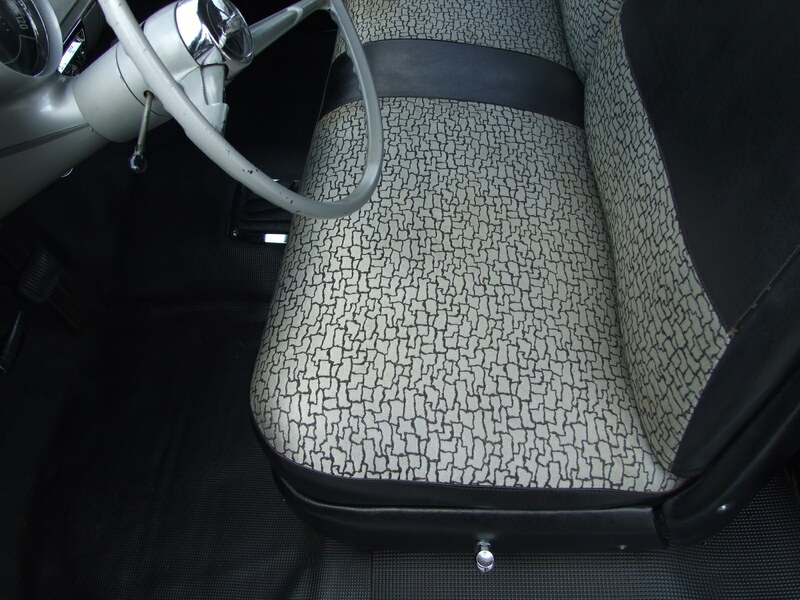 * The steering wheel and dash finish looks as if it could be original or certainly older. With the exception that we believe the black portion of the upper dash is in such nice condition it could have been repainted at some time. * Owner put speakers in the kick panels. They believe that the black vinyl of the door and side panels as well as the black and silver designed materials is how they have obtained the car, and believed they could be original as well as everything in the rear utility area is as they had purchased it. A new package shelf was installed. * Materials of the interior still have nice black coloring and seems very supple. 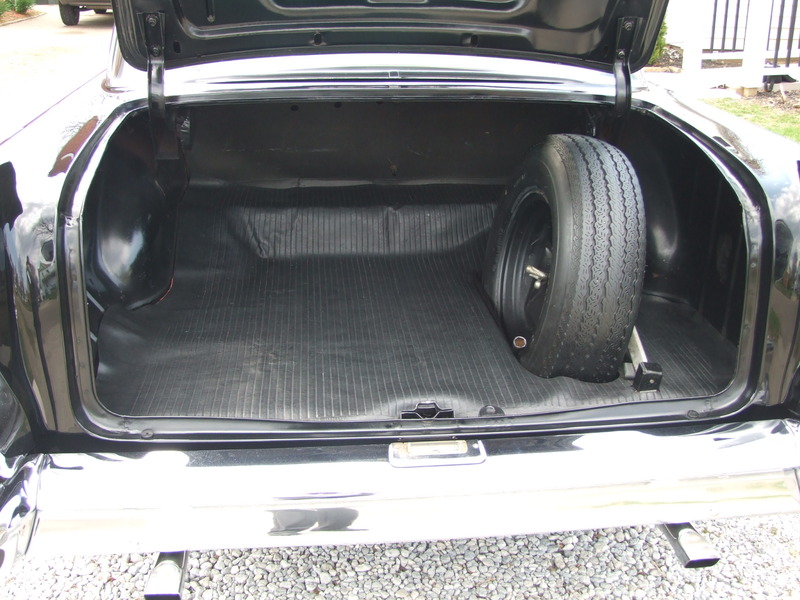 * In the trunk you will see the tire and wheel, and the older mat that is in nice condition. As well as where we pulled up the mat so you can see the floor board where we don’t see any obvious repair or restoration that we are aware of. 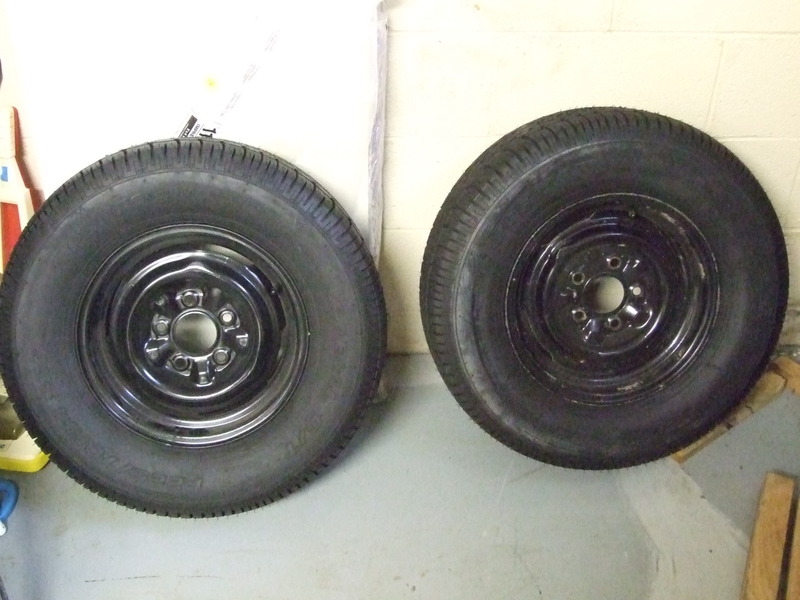 * We don’t see any cracking or obvious curb damage to the tires or the rims. The finish on the rim is very reflective. Only when you get up with in a foot of them can see some very light tarnish, or pitting on the finish (mostly on the cap itself). 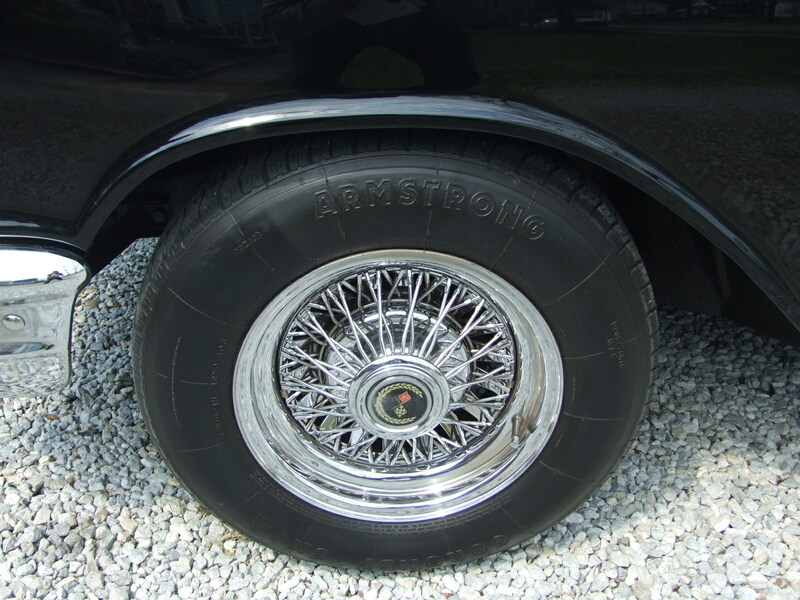 Much less can be seen on the spokes or the outside rim and may clean off with a little elbow grease. 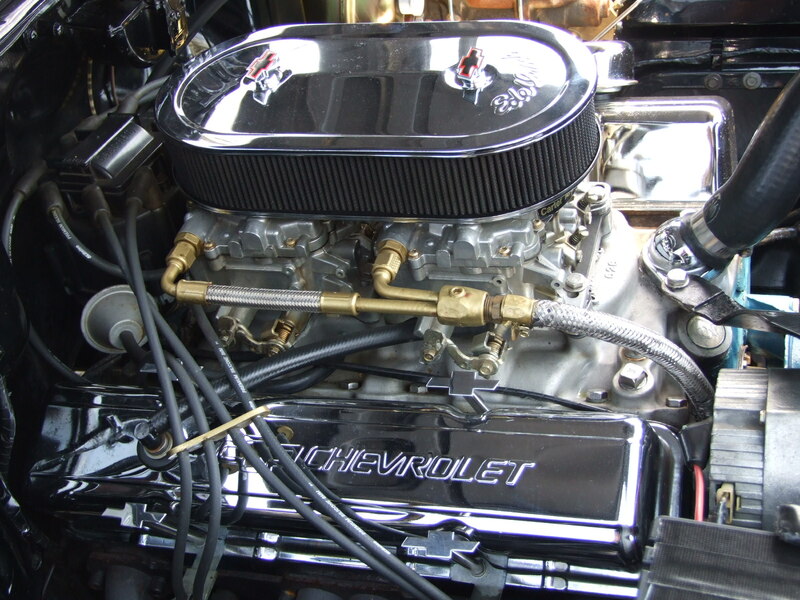 * The current owner did install this V8 engine, with Edelbrock intake, Carder AFB competition series on the 4 bbl carburetors, headers., and chrome Chevrolet air cleaners. 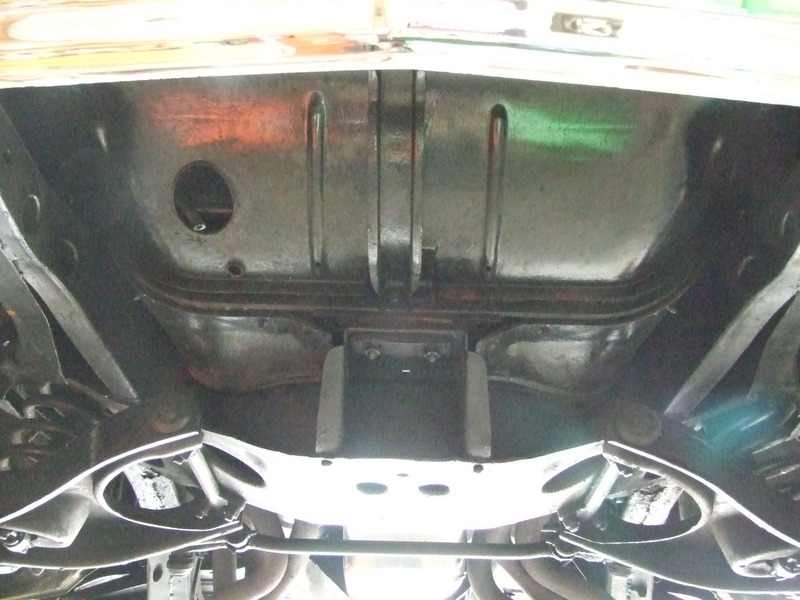 * Brakes have dual master cylinder set up, that can assist which is a safety upgrade. * It appears that the heater core and fan motor might be still in place, but not plumbed into the engine. * It has a polished brass radiator that certainly coordinates and looks nice with the brass emblems on the front fenders and the master cylinder and fuel line silver and brass theme. * They look like an equal length header set up going into the collector. We did talk to the gentleman who installed the front disc brakes at this automotive facility, and they did incorporate some newer lines that should be able to be seen from the bottom photos. * It has a newer style electronic ignition system. * When we inspected it, (with the guy who installed disc brakes) we agreed the bottom side seems to be perforation free, and does not appear to have any reconstruction. If there was we where not able to spot it, or find it at the time(though we can’t be 100 percent sure). * Chassis is very solid, and appears to be a car that all its life has received minimum exposure. * The owner did do some coating on the inside of the wheel wells. * The engine, transmission, and rear end seem extremely dry, and we did not see any spots that look like they would be incorrectly dripping oil. Car started with a couple of pumps and seemed to run fine. The carburetor set up may cause it to run a little rich if someone does not run it fast enough on a regular basis, but seems to be operating properly. The clutch seems to feel and operate properly. The shifting of the transmission is smooth, and shifts smoothly into all four gears forward and one reverse without any problem. It is a very close shifting pattern which makes it nice to operate and drive. Car stops very quickly with the disc brakes, you do have to be careful not to hit them to hard. (vacuum assist) The steering seems typical, and working as you would expect it to. Mileage not indicated on title. * When engine is warn it idles right around 50-55 lbs oil pressure, and the factory in dash temp gauge is starting to register into the warm area. However the auxiliary temp gauge does not appear to be registering at all.